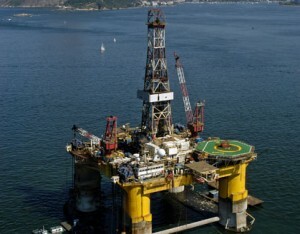 RIO DE JANEIRO, BRAZIL – The Norwegian oil company Statoil, in conjunction with operator Repsol Sinopec and partner Petrobrás, confirmed on Monday that they had made a “high-impact” discovery in the Pão de Açúcar prospect off the coast of Brazil. The discovery is located some 195 km off the coast of Rio de Janeiro state, in the BM-C-33 block in the Campos Basin, at a depth of around 2,800m. According to a statement released by the Statoil, the Pão de Açúcar well found two pre-salt accumulations comprising a hydrocarbon column of 480 meters with a total pay of around 350 meters. A test performed on a partial section of the pay zone, (the area in which oil or gas are found in exploitable quantities), revealed a flow of around 5,000 barrels per day of light oil and 28.5 million cubic feet per day of gas. Statoil give the definition of a “high impact well” as one which contains a total of more than 250 million barrels of oil equivalent (BOE), or 100 million BOE net to Statoil. This latest discovery is the third of its kind made in the BM-C-33 block, along with Seat and Gávea, the latter of which was evaluated as the biggest oil find in the Campos Basin to date at the time of its discovery in July 2011. According to Statoil, this third find only serves to confirm the area’s high potential. “This discovery increases our understanding of the pre-salt potential in the Campos Basin and improves our confidence in the recently acquired acreage position in the pre-salt Kwanza basin of Angola,” he continues, referring to the acquisition of large sections of the Angolan pre-salt in December last year, which is believed to be analogous to its Brazilian equivalent in terms of origin and potential. The Statoil/Repsol Sinopec/Petrobrás consortium has made no secret of its aggressive plans for the Brazilian oil fields. Brazil’s pre-salt reserves are among the ten key projects envisioned in Repsol’s Horizon 2014 plan, in which they also outline plans to invest €$500 million in Brazil’s oil coasts. Repsol Sinopec Sovex Rig in the Santos Basin off the coast of Brazil, photo by Repsol.com. Repsol Sinopec is a Spanish-Chinese oil venture which functions as the operator of the exploration project consortium with a 35 percent stake. The Norwegian company, Statoil, and the majority-Brazilian-government-owned, Petrobras, make up the rest of the consortium with shares of 35 percent and 30 percent respectively. 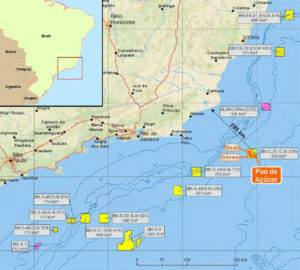 Repsol Sinopec alone is the largest foreign owner of exploration rights in the Santos, Campos and Espirito Santo Basins, working in sixteen of the blocks, of which it is the operator of six. Statoil operates the Peregrino field in Brazil, which came on stream in April 2011, and the Pão discovery is the sixth high impact discovery made by Statoil around the world in the last twelve months.